Happiness only real when shared. | Life. Realized. A blissful Friday night. Spent with my boys. Oh, these boys. This rather worn out gal needed the weekend. So here I sit. Take-in-bake pizza and warm chocolate chip cookies. Ghostbusters. Warm, comfy clothes. Yes. Just yes. Can we take a moment to talk about this kid? Gosh is he the bee's knees. 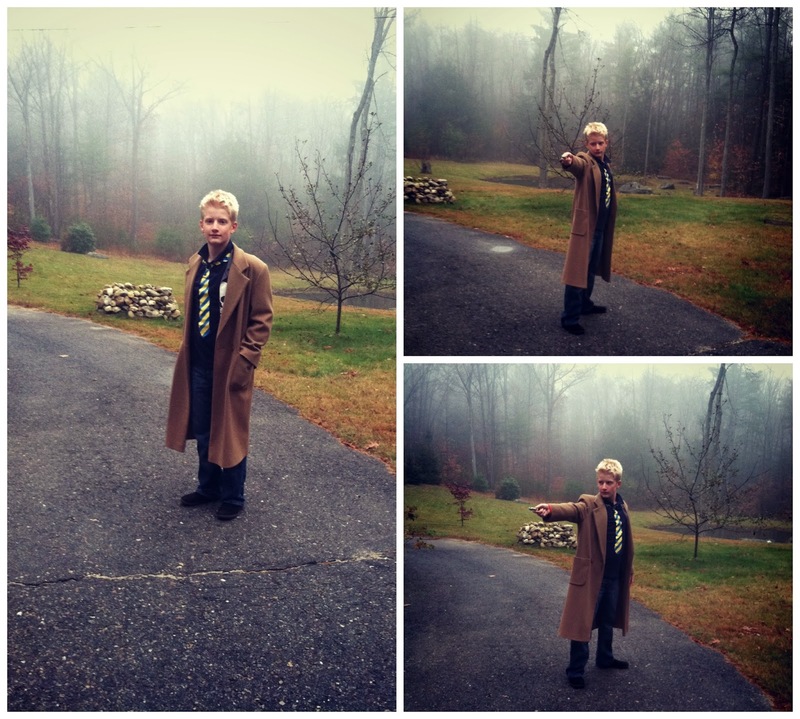 For Halloween he dressed up as the 10th Doctor from Dr. Who. A wonderfully obscure choice, in my opinion. For those who aren't familiar, it's a looong running British television show and cult favorite. I grew up with a sci-fi-loving older brother, so I have more insight than most moms, I'm sure. Boy did he look handsome. This Kiddo is pretty amazing. I'm biased, sure, but also know it to be quite true. Once Upon a Time, a show that must be watched together and from the confines of my bed. Fine chocolate (the silver lining of a dairy allergy... only high quality chocolate in this house). This young man (and a feline friend). I don't want these moments to ever end. Never ever. Last year we decided would be his last spent trick-or-treating. He's getting to that age. He can't eat 90% of his loot. It rains every year. He didn't seem to mind. I, however, began to feel nostalgic and sentimental the moment I dropped him off at school. It was one of those moments that socks you in the gut with the realization that your kiddo is getting older. The solution? A Halloween Edible Arrangement hand delivered mid-morning by yours truly. He enjoyed. He shared. I found a new tradition, perhaps. I am also fairly convinced he's part monkey. Watching him scurry up a tree is truly something to behold. His talents are endless. Really. This week ushered in his newest endeavor: fencing lessons. Of course he's a natural. This is the kid who was skiing black diamonds after just three lessons. I'm in awe of this beautiful creature. Speaking of beautiful creatures, this dude started his month-long stint as a work-from-home (only) business man. In the history of our marriage we haven't slept next to each other this many nights in row. Mario is a traveling man, that's for sure. (Insert Ricky Nelson song.) November is shaping up to be a good month, indeed. Boy am I trying to soak up my morning walk to the college. Also, this week I came to the rather startling realization that a jacket is now necessary. I learned the hard way during a particularly chilly walk spent clinging to my latte like it was a life raft of warmth. After a particularly bummer week last week, breakthroughs again abounded at CrossFit. 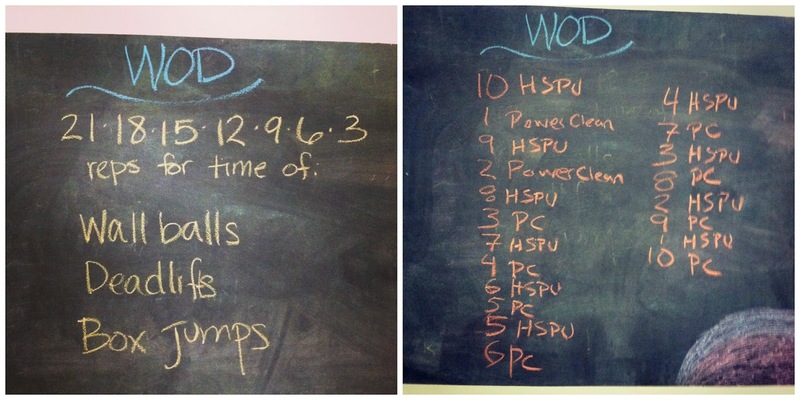 Yesterday's WOD (left) was a repeat from last month. It is hard. I shaved two minutes off my time. I'm not quite up to handstand pushups yet (HSPU), so I did straight pushups today. I've never been able to make it through pushup-heavy workouts without having to use my knees. Today I did all 55 reps... in a full military pushup position. This is huge, guys. I set a goal for myself and just did it. I can't raise my arms to change my shirt, but hey. I've also made progress in the diet department. My sweet tooth has all but disappeared and we, as a family, have tried several new veggie-heavy meals. (Cauliflower rice? Who knew?) Every single one was a hit. Woot! Sleep in! Rejoice in the wonder that is Saturday! I love the idea of an edible arrangement. :) I think it's perfect. You have the coolest child ever...and the Mario stick on that Mac is amazing! Winter is not a season, it's an occupation.